This was the Finals! 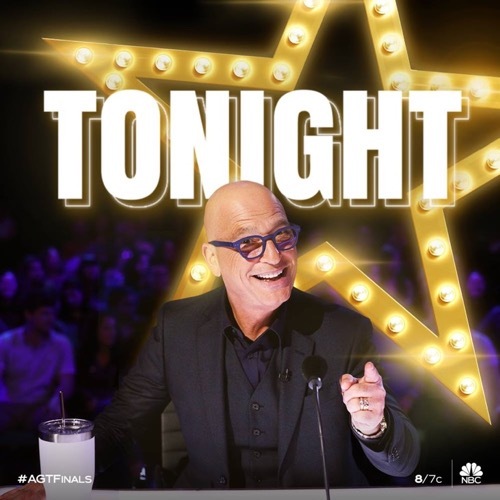 Ten acts have been put into the Finals by a combination of the Golden Buzzer and the amazing superfans at home but the judges too an additional step. They added two contestants using their Wildcards and so, all in all, there will be twelve acts performing before the huge finale next week where’ll the best of the best will be crowned. The first contestant to perform was Cristina Ramos. She won her season of Got Talent España using her amazing Rock n Roll skills, yet despite knowing her talent, the judges were still blown away by her. Cristina came out first all covered up and was singing opera. She showed off her demure style and hit some really high notes like an opera opener. Then when she had everyone hooked, she broke into her rocker persona and just took the stage by storm. Cristina was incredibly talented and the judges had only said good things about her. Simon who was perhaps the fussiest out of everyone had even said it was privileged to discover a talent like hers and so Cristina truly opened the show in style. The second contestant to perform was Preacher Lawson. He was the only comedian to make it to the Finals and he’ll be honest when he says there are other people that are perhaps funnier than him, but he got to where he is and had become a finalist on a previous season of America’s Got Talent because he works hard at the job. There were others that gave up after their first joke bombed and he was out there working every day. Preacher opened his act with one joke followed after another. He never gave up until he at least received some kind of positive feedback and so the judges noted that he’s improved a lot since they first met him. His jokes have gotten better and after he took off his shirt he showed that his body has gotten better as well. Darci Lynne Farmer was the third contestant to perform. She won her season of America’s Got Talent and had thought it was all over when she didn’t make it through to the Finals on Champions but the judges used one of their Wildcards just for her and so she was back at another try for the title. Darci brought her best and funniest version of her ventriloquist act and she as well as that puppet were just funny. Even when they were singing. They had the audience in stitches and the judges had been impressed. Simon said that tonight was greatest she’s ever been onstage, Mel B had loved her singing, and both Heidi and Howie thought it was amazing that they didn’t know that Darci could sing opera. She was still surprising them after all this time. Deadly Games had been the fourth act to perform. The duo was a dangerous knife throwing act and they had been semi-finalist both on La France a un incroyable talent and America’s Got Talent. They had received a Golden Buzzer from Heidi and so everyone thought they would have a flawless performance, but the guy throwing the knives had been a little off tonight and that more than anything had frightened the judges. Everyone had been relieved afterward when it looked like it was over and it turns out the duo still had another part to get through. They invited the judges on up on the stage and included them in the act. And so the judges felt the mistakes actually added to the knife-throwing as a whole because they truly feared for their lives. The fifth contestant to perform was Kechi Okwuchi. She was a singer who was a finalist for her season of America’s Got Talent and she received a Golden Buzzer from Simon. Simon loved Kechi and he loved her performance tonight, but Mel B was the only one that chose to be honest. She said it wasn’t one of Kechi’s stronger performances and that she had gotten lost in the song. It was true for everyone that was separating the music from the artist and so Simon shouldn’t have encouraged the audience to boo Mel B. She was telling the truth as she saw it and Kechi figured as much. She later said that she’s always thankful to receive an honest opinion and she thanked Mel B for being honest with her. The sixth contestant to perform was Brian Justin Crum. He came in fourth on his season of America’s Got Talent and he felt like he hadn’t gone far enough, so he came back for Champions and tonight he performed “Never Enough”. It was a particularly hard song to perform and so luckily Brian did justice to it. He gave it his all and he once again transported the judges with just his voice. They loved him and they enjoyed his performance though it was very telling when no one said they thought Brian could win the whole thing. They talked about how he made them feel with his music and how glad they were to have him back. And so they managed to hide how the fact that no one thought his performance of this grueling song was going to be enough to gain him the title. Angelica Hale was the eighth contestant to perform. The singer had impressed the judges when she was first on America’s Got Talent and nothing has changed between then and when she received the Golden Buzzer this season. She was an incredible singer and was so young. Angelica was just eleven-years-old and she gave one of her strongest performances tonight. The judges even took notice of her improvement because they could see how relieved she was that she had gotten every note perfect and so they let her know that she was only getting better with time. Angelica was called a little angel which was fitting with her name and she was always going to go far whether she won this season or not. The ninth contestant to perform was Kseniya Simonova. She was the Sand Artist that won her season of Ukrayina male talent. It may seem like a simple thing, but the stories she creates with the sand and the emotional angle she knows how to tap into was why she received the Golden Buzzer from Terri. He saw that Kseniya was recreating beautiful images of life and she did it again tonight when she portrayed WWII. She was so good that the judges all gave her a standing ovation. They had never seen anything like Kseniya’s and the way she manages to fit so much of a story into such a short time took their breath away. She was in a league of her own and she could win this battle of champions. Paul Potts was the tenth contestant to perform. He was an opera singer that had been struggling to make it into the business when he won the first season of Britain’s Got Talent and created a career for himself. Paul said his wife was the one that kept him humble because she had been with him through the good and the bad. So it was good to see her again and have her in the audience when Paul gave another phenomenal performance. He’s been working ever since he won the first time and it showed. He’s gotten better since then and had even left the judges impressed. Mel B said she had the best seat in the house for that concert and the other judges agreed with her because they liked Paul. He would deserve it if he won again. The eleventh contestant to perform was Shin Lim. He won his season of America’s Got Talent as a magician and the fact he could still impress the judges with his cards just shows that his showmanship has really improved. They love Shin Lim and he truly has their respect, but one of the reasons why everyone tends to enjoy his performances is because he includes the judges. He has them questioning themselves and they always trying to figure out how he did it. Like it was someone that would perfect sense if it was ever explained to them! The judges have their favorites and they love no one like they love magicians. And so it was up to the superfans to finish what they started by voting on their favorites before its too late. There was one final performance tonight and it was Susan Boyle. She was chosen to close the show because only she could be trusted to finish the show on a high. Susan was an incredible singer who had been runner-up on Britain’s Got Talent and she won the Golden Buzzer from Mel Be on her first performance in America. She’s an amazing person and with her, in the mix, there’s no telling who the superfans will vote for!